Renewed 1,000 HUF banknote denominations have been released since March 1, 2018. (The old 1,000 HUF banknotes will be accepted until October 31, 2018, after that only the new denominations can be used.) Not only did the security features of the banknotes become more modern, but also new design elements were added to them. Both the old and the new 1,000 HUF banknotes display King Matthias’ (1458–1490) portrait and emblematic images associated with the ruler. Among them are image elements of a decorative corvina page. Looking at the banknote held against the light, at the left side of the front image, a shaded watermark of indefinite contour, identical with the reflection of King Matthias’ portrait, consisting of dark-light transitions, becomes visible, which is also visible on the right side of the back image. In the upper left corner of the former banknote’s front, well palpable is a color changing (purple or olive green, depending on the angle of view) print carrying the title MBN (abbreviation for Magyar Nemzeti Bank, Central Bank of Hungary). On the new banknote, it has been replaced by the Corvin emblem next to King Matthias’ portrait: an also color changing print displaying a raven holding a ring in its beak. The hologram foil on the former banknote’s front, on the right, next to the watermark field was moved on the new banknote to the left side of the watermark field, and its content elements – repeating denomination, MNB title and Hungary’s coat of arms – were replaced by King Matthias’ portrait and the drawing displaying the raven holding a ring in its beak. The so-called image prints of the new banknotes did not change as compared to the old ones, and they also feature intaglio printing producing a well palpable rough surface. The image on the back of the banknote shows Hercules Fountain at the Renaissance Royal Palace of Visegrád. Initial “C” beside Hercules Fountain is a detail of a corvina – Rhetorica by Georgius Trapezuntius –, displayed on the recto of the decorative page of the codex . On the front of the banknote, left to King Matthias’ portrait, a detail originating from the bottom part of the decorative frame of the codex can be seen, which, in the original version, featured King Matthias’ coat-of-arms between two angels. On the banknote, the coat-of-arms is replaced by a Corvin emblem, the raven in color changing print, holding a ring in its beak. 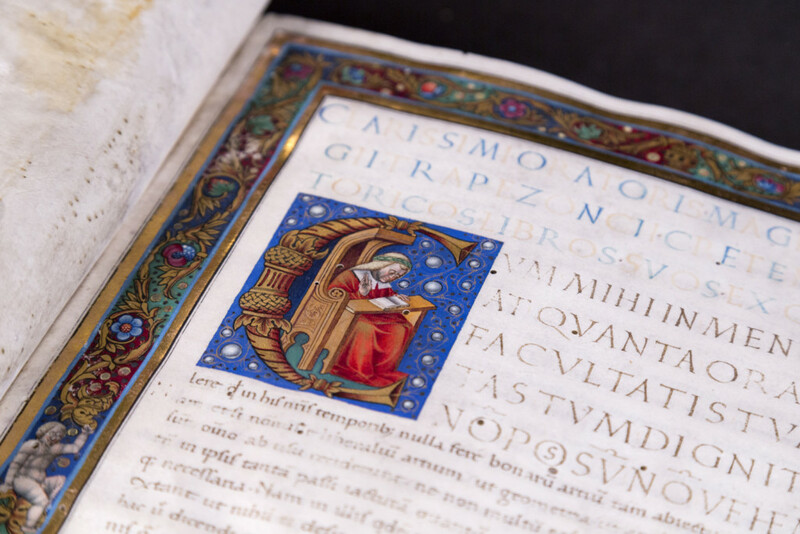 One of the most precious items of the Manuscript Collection of National Széchényi Library (shelfmark: Cod. Lat. 281.). It was made in Buda in the 1480s. The work by a humanist of Greek origin Georgius Trapezuntius, translated into Latin, was decorated by the same master and workshop in Buda, that decorated the Viennese Ptolemaios corvina, the Aristeas corvina kept in Munich, as well as the Tolhopff corvina kept in Wolfenbüttel. 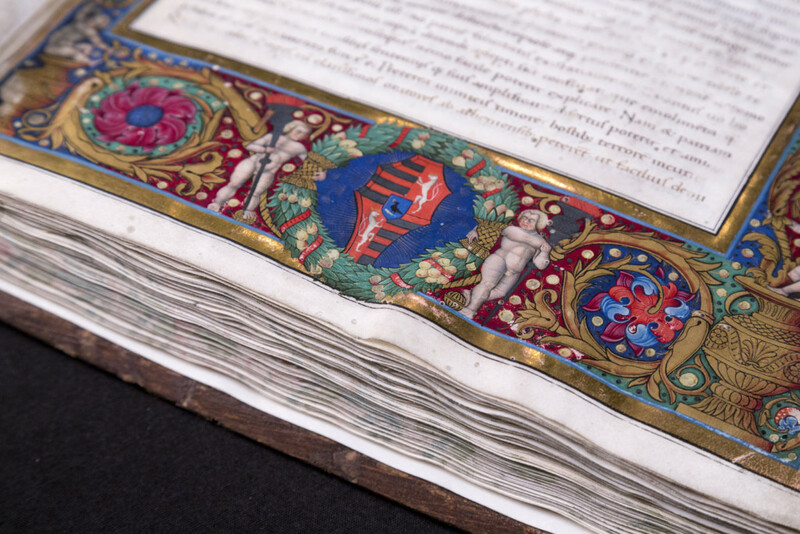 Works by the unknown master show the effect of Franciscus de Castello Ithallico, who stayed in Hungary in the early 1480s, and illuminated Breviarium of the Provost of Székesfehérvár Domokos Kálmáncsehi here. 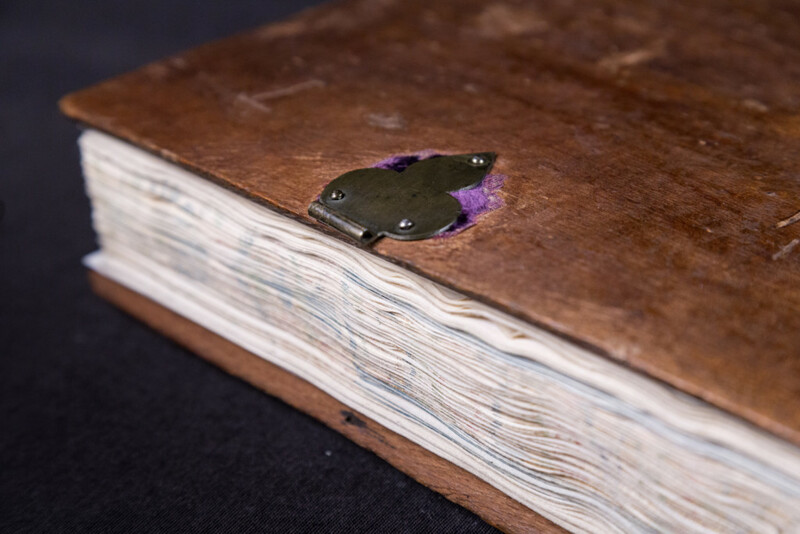 Originally, Trapezuntius corvina had a purple velvet binding; the book features color painted gilded edge. 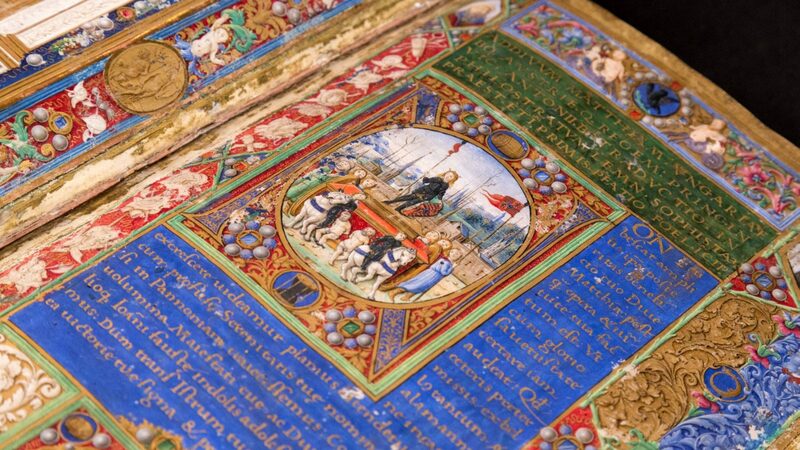 Trapezuntius codex was one of the four codices that were given back in 1869 to Franz Joseph, King of Hungary as a gift by Abdülaziz, Sultan of the Ottoman Empire. Having travelled to the opening ceremony of the Suez Canal, Franz Joseph also paid an official visit to Constantinople where, during sightseeing, he showed great interest in the items, once belonging to the royal library of King Matthias, that had been taken to Constantinople in the 16th century. Travelling back after the visit, the king was awaited by the sultan’s gift in Trieste. Franz Joseph commissioned the legal predecessor of the Hungarian National Museum to keep the corvinas.